Welcome to the checkatrade page for T S Waste. We are a waste removal company. London based. We have been established for nearly 5 years working alongside Builders, Estate Agents, Homeowners, and Shop owners with an honest, friendly and reliable service. We are fully licensed with the environment agency and fully insured including public liability. 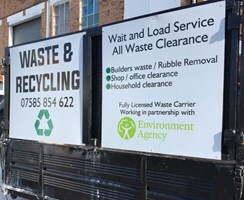 Our waste removal service involves: Builders waste, office clearance, garage clearances, garden waste, house and flat clearance and shop and unit store clearances. YOU NAME IT, WE CLEAR IT. We cover all areas of North London and East London. Essex and surrounding areas. Our prices are competitive and fair. Our trucks can get to places Skips can’t. There is no need for permits and the hassle that come with them. We work around your schedule and work during hours that suit you.